The viceroyalty of New Granada, part of the Spanish Empire, existed between 1717–1723 and 1739–1810. Nowadays, most of its territory makes up Colombia. 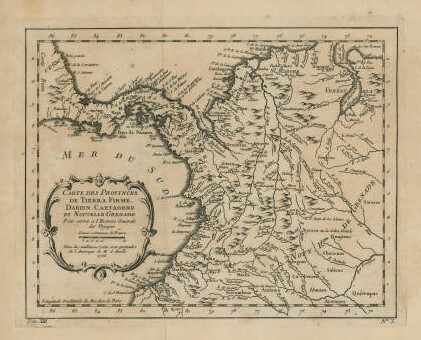 Jacques Nicolás Bellin (1703–1772): Carte des provinces de Tierra Firme, Darien, Cartagène et nouvelle Grenade pour servir à l’Histoire générale des voyages, 1756. In May 1807, a group of farmers and ranchers from the lands around Santafe, the capital city of the Viceroyalty of New Granada (today Bogotá, the capital city of Colombia), wrote a complaint about meat prices. Since the seventeenth century, the city council had set the price of meat and compelled the prosperous ranchers to supply the official butcher’s shop of the city with cattle. For them, the static prices were a cause of loss and detriment, especially during the years prior to 1807 due to the lack of water and grasses, the droughts and frosts, and the mortality of cattle. However, the complaint was not an invention by businessmen looking for greater earnings with fewer costs. The droughts of those years, did not only affect the big landowners but also the general population. Moreover, the crisis was not merely a problem for central New Granada, but disturbed different parts of the viceroyalty and others in present-day Latin America. The droughts of 1804 and 1806–1807, were confirmed by other parts of the population and sources. For example, the indigenous people of the province of Santafe (who by that time made up around 30% of the total population, which was mainly composed of whites and mestizos) were not able to pay their taxes due to lost harvests and livestock. In the city, Jose Maria Caballero, a known owner and seller of groceries, recorded in his notebook the general increase in price of all kinds of products, such as sugarloaf, sugar, butter and tallow, flour, potatoes, and liquors. The shopping lists of the members of the Royal Botanical Expedition to New Granada, which record the provisions they bought, show the same problem of scarcity and high prices. One of the most remarkable examples was tallow, a raw material indispensable not only for cooking but also for making candles. When the grasses were dried by the droughts, cattle became thin and their fat decreased, and so did the amount of meat they produced. Consequently, the tallow prices, in this case out of official control, increased. Prices of some stores in Santafe, the capital of New Granada, based on data from the shopping lists of the Royal Botanical Expeditions to New Granada, analyzed by James Torres-Moreno. The graph was created by Katherinne Mora and is based on data by James Torres-Moreno in Minería y Moneda en el Nuevo Reino de Granada. Bogota: ICANH, 2013. But the droughts were not only visible in the complaints and prices. Lamentably, we do not have quantitative, continuous, and systematic meteorological records for the first half of the nineteenth century. Nevertheless, for the first half of 1807 and the year of 1808, one of the most famous science pioneers in Colombia, Francisco Jose de Caldas, recorded precipitation in Santafe. 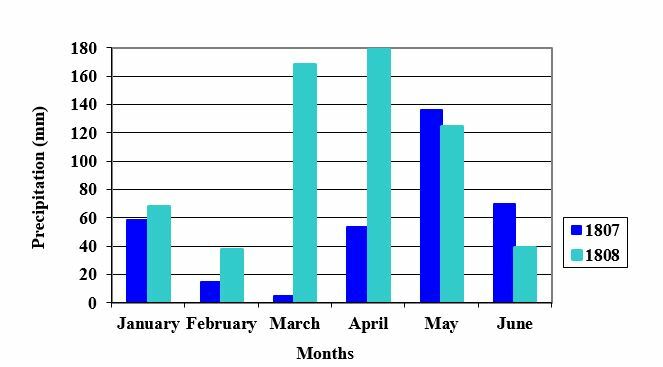 In the city, in a normal year, the rainiest months are March, April, October, and November. Howwever, as the graphic shows, in 1807 the usual rainfall did not arrive. Precipitation in Santafe (millimeters) during the first half of 1807 and 1808, based on data by Francisco Jose de Caldas. The graph was created by Katherinne Mora and is based on data by Francisco Jose de Caldas. The droughts and general scarcity of the first decade of the nineteenth century were not a problem that was confined to the Santafe Province. Since 1802, on the Caribbean coast, in the Province of Cartagena, the lack of beef was notorious and the inspections carried out in order to confiscate cattle in the plains of Valledupar and Mompox were in vain because the officers could not find any animals. By 1807, the lack of water and food in the province was widespread, requests for donations were not attended to, and starvation and revolts demanding bread were common. The crisis affected all kind of people: whites, mestizos, and indigenous people; herders, large cattle owners, and croppers of plantain. The losses of animals and harvests were a precedent for many farmers who intentionally did not plough nor sow their lands. Consequently, by 1808 scarcity remained. But the “bad weather” was not an exclusive concern of New Granada. According to experts like Enrique Florescano and Georgina Endfield in the Viceroyalty of New Spain, and Margarita Gascón, Cesar Caviedes, María del Rosario Prieto, and Facundo Rojas, in the Viceroyalties of Peru and the Rio de la Plata, the first decade of nineteenth century was characterized by weather pressures. Crops and livestock everywhere were damaged by floods, frosts, and droughts. People of every ethnic group and economic activity wrote complaints to the authorities about the scarcity, high prices, and taxes. For present-day Latin America in that period, the most critical years of 1802–1804 and 1806–1807 have been identified as ENSO (El Niño/South Oscillation) events by Hocquenghem & Ortlieb, Quinn & Neal, Caviedes, and Gergis & Fowler. This oceanic and atmospheric phenomenon, generated in the South Pacific Ocean but responsible for aperiodic global alterations of winds, temperatures, and precipitation, is one of the plausible causes of droughts and floods in that time. The documentary evidence of ENSO events in other regions should be explored. The relation between the crisis triggered by the weather in those years and the independence movements in the former territories of the Spanish Empire is not yet clear, but is an interesting topic waiting to be explored by researchers. Mora, Katherinne. “Droughts and Scarcity Before the Independence, Viceroyalty of New Granada, 1800–1810.” Environment & Society Portal, Arcadia (Summer 2017), no. 16. Rachel Carson Center for Environment and Society. https://doi.org/10.5282/rcc/7899. Caviedes, César. El Niño in History: Storming through the Ages. Gainesville: University Press of Florida, 2001. Endfield, Georgina. 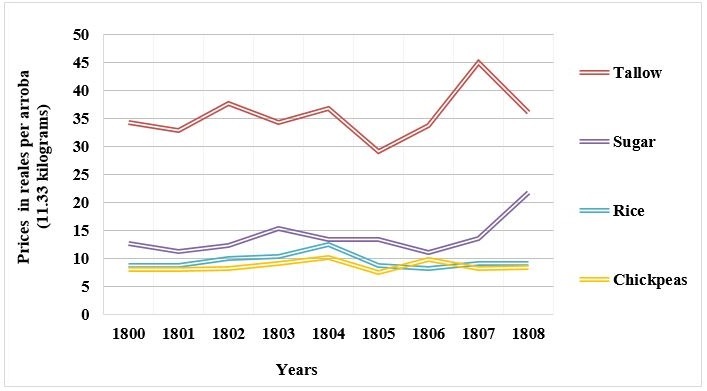 Climate and Society in Colonial Mexico. A Study in Vulnerability. Malden, MA: Blackwell Publishing, 2008. Florescano, Enrique. Breve historia de la sequía en México. Mexico: CONACULTA, 2000. Gascón, Margarita, and Cesar Caviedes. “Clima y sociedad en Argentina y Chile durante el periodo colonial.” Anuario Colombiano de Historia Social y de la Cultura 39, no. 2 (2012): 159–85. Hocquenghem, Anne-Marie, and Luc Ortlieb. “Eventos El Niño y lluvias anormales en la costa del Perú: siglos XVI-XIX.” Bulletin de l’Institut français d’études andines 21, no. 1 (1992): 197–278. Prieto, Maria del Rosario, and Facundo Rojas. “Determination of Droughts and High Floods of the Bermejo River (Argentina) Based on Documentary Evidence (17th to 20th century).” Journal of Hydrology 529 (2015): 676–83. Quinn, William, and Victor Neal. “The Historical Record of El Niño Events.” In Climate Since A.D. 1500, edited by Raymond S. Bradley and P. D. Jones, 623–48. New York: Routledge, 1995. Mora, Katherinne: "Farmers, Herders, and Floods: Social-ecological changes in Colombia’s [...]." NiCHE 2016. Prieto, M. d. R., and F. Rojas. “Climate anomalies and epidemics in South America." Climatic Change 118 (2013): 641–58. Gergis, J., and A. M. Fowler. “A History of ENSO Events Since AD 1525.” Climatic Change 92 (2009): 343–87. Katherinne Mora holds a Master’s degree in environment and development and a new PhD from the history program at Universidad Nacional de Colombia. Her dissertation is about the adaptation strategies employed by farmers and herders of the Sabana de Bogota (Eastern Andes of Colombia) to coexist with climate variability in the eighteenth and nineteenth centuries. Her research interests are the climate history and the agricultural history of Colombia during the Colonial period and the nineteenth century. Her main publications are the book Prácticas agropecuarias coloniales y degradación del suelo en el Valle de Saquencipá, Provincia de Tunja, siglos XVI y XVII. (Bogota: Universidad Nacional De Colombia, 2015), the book chapters “Agriculture and Livestock in Wetlands in the Bogota Plateau (Colombia), Eighteenth Century. Land Use and Wetland Management” In: Environmental History in the Making. Volume II: Acting, edited by Cristina Joanaz de Melo, Estelita Vaz y Lígia M. Costa Pinto, 3–13 (Cham: Springer, 2017), and “Agricultura, ganadería y degradación del suelo en Saquencipá, Nuevo Reino de Granada, s.XVI y XVII.” In: Semillas de Historia Ambiental, edited by Stefania Gallini, 157–182. (Bogota: Universidad Nacional de Colombia, 2015), and some articles published in Colombian and Spanish journals.